Indian-Railways World’s ninth-largest commercial or utility employer and State owned and operated by the Government of India. IRCTC's (Indian Railway Catering and Tourism Corporation Limited) Online Passenger Reservation System provides single window information through universal number ‘139’ through BSNL network. Interaction with professionally trained agents in Hindi, English and regional languages booking facility of Railway tickets online and offers, premium services through single window information with universal number ‘139’. The above services offered through BSNL network at Rs.1.20 per minute across the country. 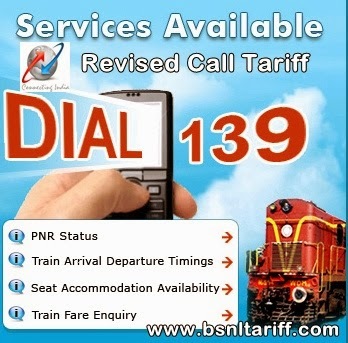 India’s most trusted telecom brand Bharat Sanchar Nigam Limited (BSNL) has revised price point for Railway Enquiry service number ‘139’ from Rs.1.20 per minute to Rs.2.00 per minute. The above revision is with effect from 01-02-2014.